Lunar New Year, also known as Chinese New Year, is a festival that celebrates the beginning of the new year based on the lunar calendar. It is arguably the most important holiday in East Asia and is recognized globally. During the holiday, it is a time for families to come together, honor ancestors, pop firecrackers in the streets, watch lion dancing, and practice old traditions that bring good luck to the new year. 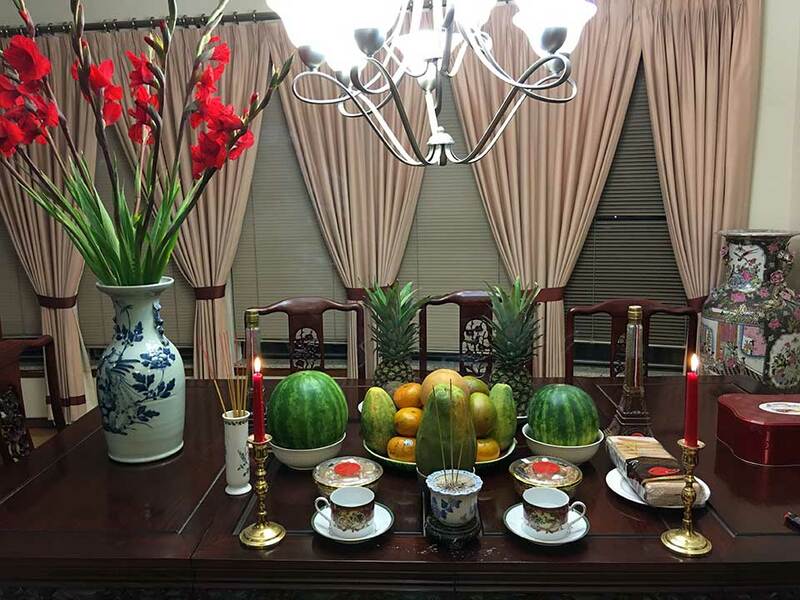 During Lunar New Year’s Eve, it is a tradition to display fresh fruits and flowers on the table to pray for a new year filled with prosperity, beauty, and happiness. In my family, Lunar New Year—or Tết, as it is called in Vietnamese—is a big deal. This was my favorite holiday growing up because I would receive lucky red envelopes or li xi filled with crisp new money from my elders wishing me a prosperous year. It is a time for me and my family to come together and embrace our Vietnamese culture. Since 2019 is the year of the pig, let’s talk about food. I believe the best way to share one’s culture with others is at the dinner table. My aunts would spend hours cooking delicious homemade dishes at every Vo family gathering, and we would eat until our pants couldn’t fit. But everyone always made room for my mom’s famous măng kho thịt. Măng kho thịt is a traditional Vietnamese dish from Mũi Né Phan Thiết, which is a small village in South Vietnam by the coastline. My dad and his family lived there before immigrating to the United States in 1978. Măng kho is a rich and hearty dish made from softened bamboo, juicy pork belly, and fish sauce. It is best served with jasmine rice and shared with loved ones. 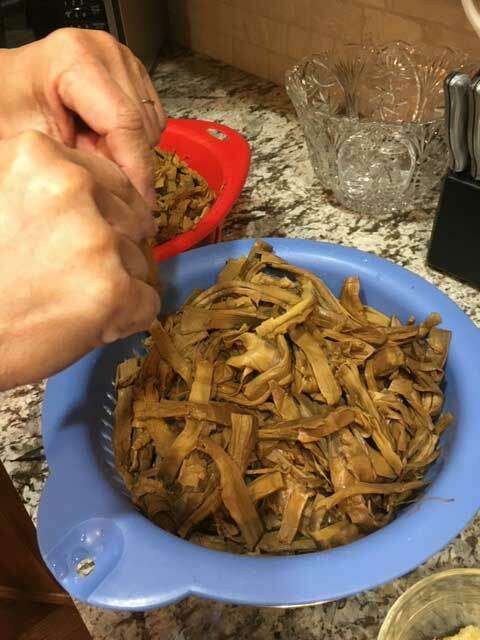 My mom vividly remembers sitting down next to my grandpa and taking her first bite of măng kho thịt. She immediately fell in love. My mom’s first time eating măng kho thịt was during her first Lunar New Year celebration with my dad’s family after getting married. She vividly remembers sitting down next to my grandpa and taking her first bite. She immediately fell in love. She asked my dad’s sisters for the recipe, and over the years she has developed her own unique style on the classic dish. The dish takes several days of preparation and dedicated hard labor. My mom would say she doesn’t mind the time and energy because she wanted to pass down her husband’s family tradition to her children and future grandchildren. Every Lunar New Year, I always look forward to măng kho thịt at the dinner table with the Vo family. Note: The original recipe uses a slow cooker, but using a pressure cooker can reduce total prep time in half. 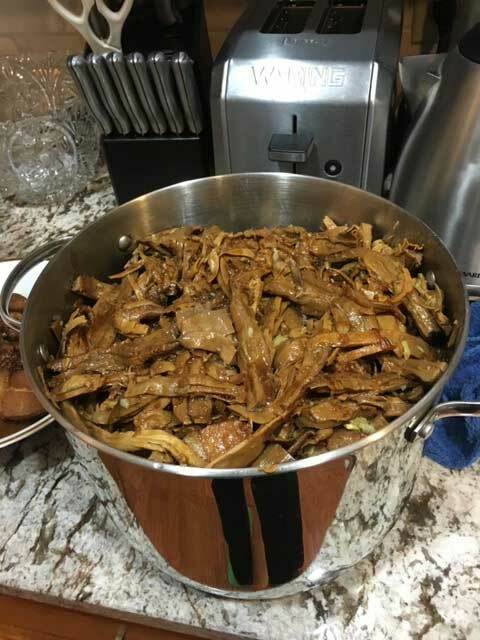 Place the dried bamboo in a slow cooker and fill the pot with water covering all the bamboo. 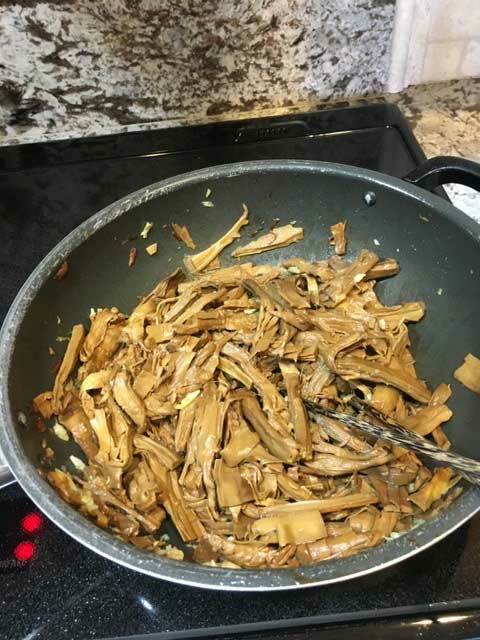 Slow-cook the bamboo for 24 hours (can be spread out 3 over three consecutive nights, 8 hours per night). Change the water every 8 hours. Drain the water and let the bamboo cool down. Shred the bamboo into small pieces and cut off any old/tough bamboo parts. Mince 3 or more cloves of fresh garlic. 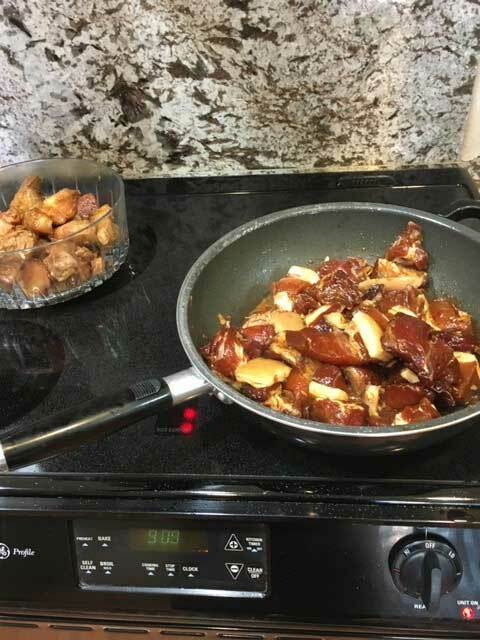 Begin making the marinade by mixing 1 cup fish sauce, 1 cup soy sauce, 1½ cups brown sugar, 2 spoons of thick soy sauce, pepper, and minced garlic. Cut the pork belly into small or medium-sized squares. 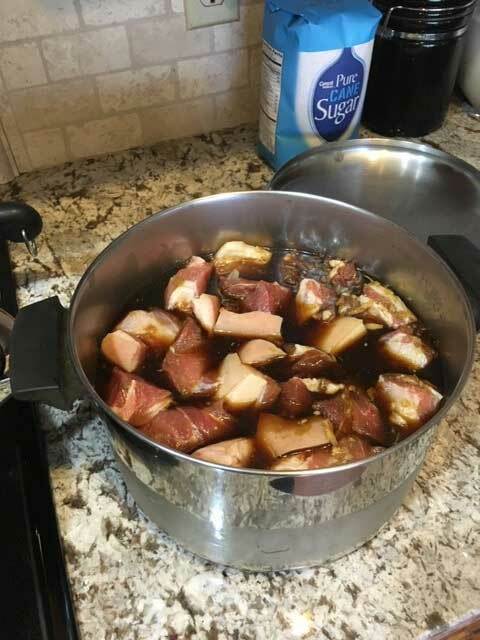 Let the pork belly marinate overnight in the sauce. Grab a large frying pan and sauté the pork belly in olive oil for 15 minutes and then leave to the side. In the same frying pan, sauté the bamboo in olive oil and minced garlic for 5 minutes. Start with small amounts of bamboo and gradually add larger amounts into the pan. In a large pot, layer the meat and bamboo on top of one another like lasagna, starting with the pork. Add ½ cup fish sauce, ½ cup soy sauce, and ½ cup brown sugar into the pot. 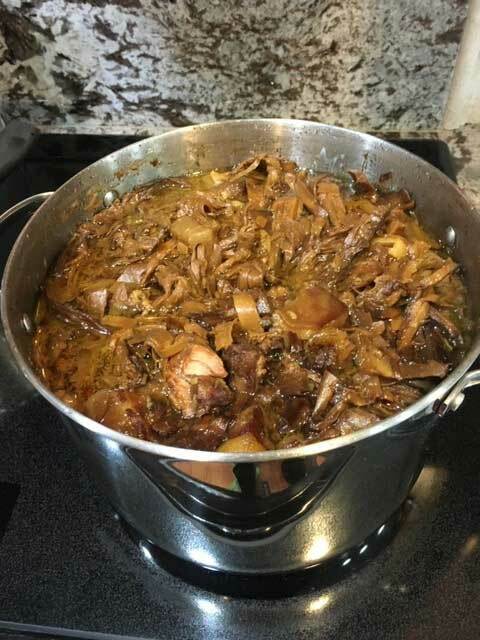 Cook on the stovetop, partially covered, at low to medium heat for 4 hours—do not stir. Serve with jasmine rice and enjoy with your family and friends!